I’ve been dying to try this one out since I heard it came out. I’m a huge fan of Moroccan Oil for my hair but I find that my hair seems to do better if it’s infused into the shampoo rather than on it’s own. I think I get a little overzealous and put too much oil in and it ends up leaving my hair oily at times. Having the Moroccan Oil already mixed in is perfect! 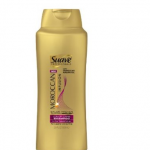 Check out the new Suave line at your local drugstore or via one of my Amazon links above! Love how the drugstore brands are stepping things up!